Two years after winning the infamous and international Diagram Prize for the Oddest Title of the Year, Strangers Have the Best Candy continues to pop up on lists all over the internet. Here are some of the latest I’ve found in my Google searches. The Newcastle Advertiser featured Strangers Have the Best Candy at #9, below Pop Sonnets and above Dinosaurs With Jobs. I noticed one day that book sales were trending up. 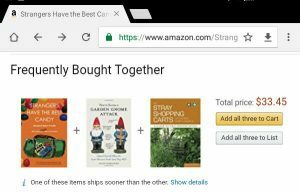 Not only that, but Amazon was offering Strangers together with How to Survive a Garden Gnome Attack and Stray Shopping Carts of North America. A Google search discovered this list on Buzzfeed, with Strangers at #20, below the Bill Murray Coloring Book. Julie Jarema of Riveted came up with rather obscure, but excellent titles, including How to Raise Your IQ by Eating Gifted Children and The Do-It-Yourself Lobotomy. Strangers Have the Best Candy is listed as the #1 Travel Book on the Crushing Tomatoes blog. It’s an honor, but to be honest, the review is completely anonymous and slightly suspect. I prefer the Buzzfeed list, myself.